Our community knows how important it is to maintain an active role in our own health. Starting Friday, September 28, 2018 through Sunday, September 30, 2018 Neighborhood Medical Center will be hosting our 4th Annual Health Extravaganza for National Gay Men’s HIV Testing Day. All events will take place at Hotel Duval (415 N. Monroe St. Tallahassee, FL. 32301) and will be free of charge to the general public. An event to close out the Health Extravaganza weekend. 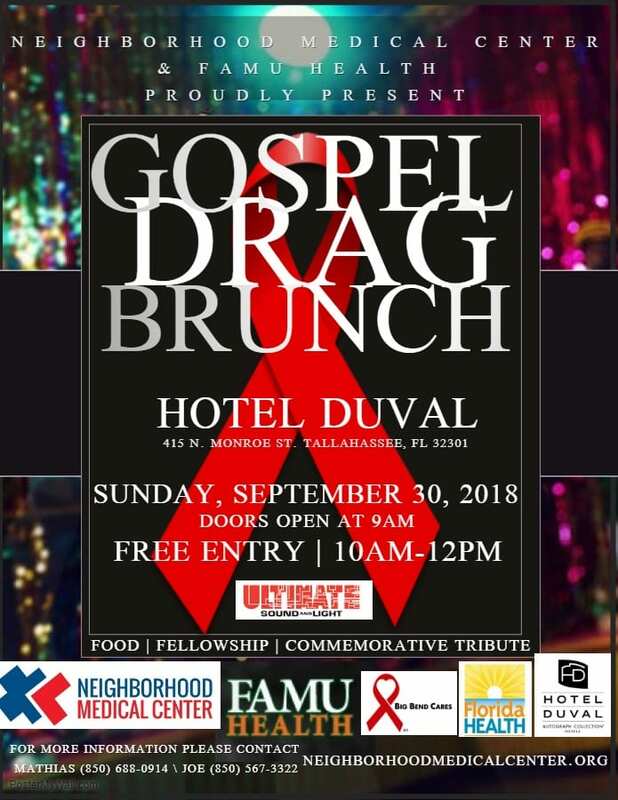 We will fellowship through food and song as we commemorate the precious lives lost in the LGBTQ community and individuals affected by HIV/AIDS. No one will leave this event empty handed or uninformed as we will have booths presented by our partner agencies: Big Bend Cares, FAMU Health, FSU CHAW, and Florida Health, amongst others. Please come out to help Neighborhood Medical Center and our partners spread the word to patients, family, friends, and community members about PrEP and HIV/AIDS.